Looks like the gardening day I have been waiting for, has actually arrived. 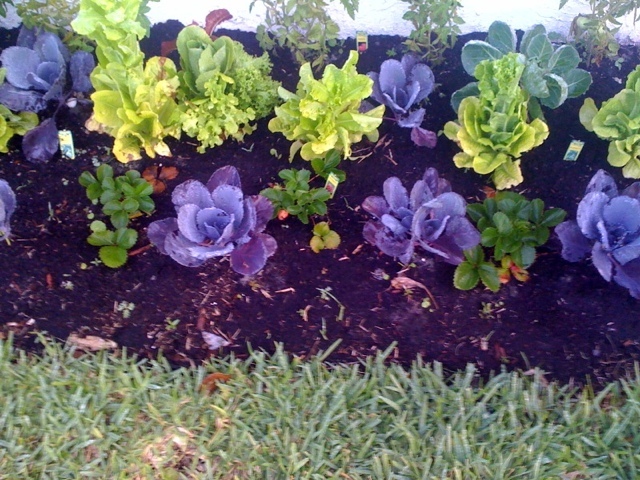 As winter quickly turned to summer in South Florida, the lettuce I planted is ready to be eaten or burn up! I will be pulling carrots, picking tomatoes and peppers, and pulling up a few heads of lettuce for tonight’s VFT salad! With some basil and other assorted herbs, and even a strawberry or 2, it will be our first, completely homegrown Thursday night salad. For the rest of the menu, you’ll have to show up for dinner. We gather at 8 and we always welcome mystery guests! The more the weeks go by, the more sure I am that NBC must have gotten slammed with law suits or at least problems regarding the challenges on previous seasons. Once again, I ask, “is there no happy medium?” Last night’s challenges boiled down to dropping balls into a pail and digging eggs out of the ground…such a far cry from rowing through unknown waters, treading backwards suspended above water, or many of the extreme challenges (and I did think they were overly extreme) contestants were faced with in previous years. Alison shows the contestants a video from the time she first told them they “made the cut,” and we this season’s contestants. Wow! How far they have all come in just 3 months!!! Next, we meet the 12th couple, which honestly I never noticed were missing. Enter and weigh in, Vance and Leann, the White team from Utah. They must be Kalyee’s percentage of body fat lost so far. Kaylee has the lowest at 25.32%. Last week, Kaylee would have hoped to lose this weigh in, but of course, this week, she realizes she really does need to stay on the ranch. Lucky for her, white team did just OK at home. Vance lost 30 pounds and admits that it was really hard to focus at home, but 30 pounds is 30 pounds. Leann lost 45, a great number, but not enough to send Kaylee home. We say goodbye to white team (that was quick) and it’s time for a pop challenge. 2 members from each team must balance balls on a board and bring them to a basket across the field to drop them in, through a little hole in the board. This was like the little tiny handheld games I remember as a kid. The ones where you had to get the little silver balls into the holes in the picture. If you don’t remember them, you are too young 🙂 This challenge, which honestly requires no athletic skill whatsoever, finds green team winning with a one minute advantage at the non-pop challenge. The Red team, which is just Jen and Courtney, loses and they have to leave the ranch for a week. Alison gives them 1000 dollars and a menu and tells them she will be back in 15 minutes. If they want to have their trainers, its 200 bucks a day, but they opt for a week’s gym membership, which is cheaper. They have to make choices about food and decide they are OK to shop for it and prepare their own meals. These choices leave them some money for luxuries like massages, a night out at a restaurant and phone time and they opt for all of those. I can’t say I blame them for their choices, but they turned out to be poor ones, in the end. As they pack to leave, Brett tells them exactly that. He does give them a lot of direction and instruction and though Courtney is not so confident, she follows Jen’s lead. Then the big (not so) challenge, an Easter egg hunt. The teams will have to find their team colored eggs (600 for the 3 people teams, 400 for Jen and Courtney). Each team that completes the challenge will go to a special screening of the movie Hop. The team that comes in first will get 2 tickets to the world premiere of the movie and the person who finds the one and only golden egg will get get something very special. Green team manages to make their one-minute advantage work, and they come in first, red second, black third and blue, last. Olivia find the golden egg and learns that she has won the ONLY vote at elimination, assuming her Blue team does NOT come in last at the weigh in. Olivia, by the way, does NOT consider this a gift, but instead a burden. She does realize that she may be able to keep her sister there another week though and that seems to instantly help! They all see the movie and get to meet James Marsden. I have no clue who he is, but they all seemed to. After the movie, its the last chance workout. Each team’s biggest loser gets immunity. Since Jen and Courtney are a team of only 2, one of them will get immunity and should their team lose the weigh in, the other will automatically be eliminated, but they remain confident. Their confidence was ill-founded. Courtney lost only 2 pounds, and worse, Jen lost none. This makes them the losing team and we quickly say goodbye to Jen. She started her journey at 278 and today she weighs 173. Down 105 pounds, working out at home with her brother, she hopes to lose another 30. She looks beautiful! I apologize for typos and and inconsistencies. I have overspent my morning computer time!!!! Let me know what you thought of last night’s episode…and make it a wonderful Wednesday. Good morning. I have been spending some time reading up on some peace and fitness news. Sometimes, everything old is new again. Such is the case in a recent study that found that drinking 2 eight-ounce glasses of water 30 minutes before meals caused a greater weight loss than in the group that didn’t drink the water. In fact, the water drinkers lost 44% more in 12 weeks than the non-water drinking group. Lead author, Brenda Davy, in the study which appeared in Obesity, said that guzzling the 2 glasses of water before meals will help you consume between 75 and 90 calories less per meal. Additionally, there have been many studies supporting the idea that staying well hydrated may help increase metabolism, specifically FAT metabolism. Especially when trying to lose weight, always opt for plain old water, instead of the ones that are enhanced, which often contain added calories. Drinking fresh water as much and as often as you can will also help flush toxins, keep your kidneys and bladder humming smoothly and keep your brain sharp. So, if you aren’t sipping a glass right now, shouldn’t you be? If you are still unsure about the benefits of water, “observer a plant before and after watering and then relate those benefits to YOUR body.” Thanks, again, to our friends at lululemon for that quote! Biggest Loser tonight. I can only imagine how much water they drink, though I don’t often hear them talking about that. I did hear recently eliminated contestant, Arthur, talk about his calories in and calories out. He eats somewhere around 12 hundred calories a day and burns 7,000 via his daily exercise. This is AT home, after elimination. He walks 5 miles to the gym, trains, walks 5 miles back home. Real results require hard work and no doubt, lots of hydration! Drink up. Did you know that even a little stress can damage, over time, can damage our health and lead to possible permanent disability? A study of more than 17,000 Swedes in Stockholm county proved that the higher the levels of psychological stress, the higher the likelihood of a person needing a disability “pension award,” five years down the line. Even people with the mildest levels of distress had an extremely elevated risk of receiving those benefits. Researchers concluded that the demands of modern society may be exceeding human ability. This study published in the Journal of Epidemiology and Community Health, and MANY others are good reminders that we all need to find effective ways to cope with the day to day stress we all encounter. Some great suggestions from the Mayo Clinic are being active, meditating, getting enough quality sleep and practicing yoga. It’s often said that stress is related to 99% of all illnesses. Makes sense that their would be a connection between it and collecting disability. It is my personal goal to remain productive to my family, my friends and the world at large for as long as possible. To that end, I am rather happy that I practice those things suggested by the people at the Mayo Clinic. I am so happy that the pool has warmed up enough to have me back in there swimming. Some activities, like swimming, allow one to both be active and meditative. Running, yoga, Pilates…they all share that quality. Fitness is the magic bullet to good health and happiness. Peaceandfitness. Get yours! Think about it. It makes a lot of sense. Be present. Enjoy this day. Enjoy this moment. At present, this very moment is all we really have. I am flattered and humbled that in this moment, you are here. Thank you. This morning, I offer my deepest sympathy to Judy A. On this very sad and challenging day, I would like to share with you a poem that was given to me by my sister when we lost our mom. I keep it beside my bed and it reminds me that we carry our loved ones with us, eternally. They are not only in our hearts but in all that we see as beautiful. In all the gifts from mother nature, Barbara will be right there with you and her loved ones on earth. Please give your granddaughter a hug from me and know that my thoughts are with you. I hope this native American prayer brings you, and all of you who have lost loved ones, just a little comfort. I am the soft starts that shine at night. I am with you still in each new dawn. I have the information for the service (this afternoon) and also the address to send cards to. Please let me know if you need either as I refrain from sharing too much personal information (especially about others!) on the net. Though I will be unable to attend the memorial service, my thoughts will be with Judy and her family. I will be at the gym this morning for my regularly scheduled class. In going through your day, remember that we often don’t know the pain those around us are feeling. Let’s try to be extra kind and patient with our fellow human beings. We are all connected. I am often asked about the rule of thumb regarding resting an injury. Being overly cautious, I generally suggest erring to the side of caution, yet when I tore my own hamstring, after a day or two of rest, I was going out of my mind and out of my body. I had to move. Turns out new research by the the scientists at the University Hospital of Ulm, in Germany, found that while runners needed to rest through bone and joint injuries, they WERE able to run through most muscle pain, especially muscle pain in the leg. In fact, Stephen Fealy, an orthopedic surgeon at New York’s Hospital for Special Surgery, says that “if you’re pain free at rest, the problem’s most likely muscle and you CAN keep on going. But if you have pain at rest, it could be a bone or joint issue that you need to see a doctor about.” Though this particular study was done with runners, I would imagine you can apply it to all sports and all situations. Personally, I must say that the leg of the hamstring I tore, is now, a year and half later, every bit as strong and definitely even MORE flexible than the other leg, as a result of the stretching and movement I did almost immediately following my injury. I am glad I worked through the pain. Thanks to Gordy Megroz and Men’s Journal for this information. Whatever life holds this day, every day, I hope we can all handle our setbacks and emerge “successful.” Thanks for stopping in. Thanks for taking care of yourselves and each other. FORKS over KNIVES Update…Please Share! It has been just about a year since I decided to become a lot more “veganish.” I am loving the journey, physically, mentally, spiritually and emotionally. The big bonus is that I also enjoy cooking again after many years of struggling in the kitchen. 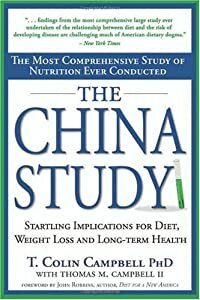 The China Study greatly impacted me and in less than 2 months, FORKS over KNIVES will come to the big screen right here in my own backyard, aka, Sunrise, Florida. Those of you in other parts of the country may find it previewing early, near you. If you don’t already get this, below I have copied and pasted their March newsletter. Please read and if you would be kind enough to repost on a site, send in email, post on Facebook or tweet about this, it would be great! Thanks, and have a wonderful VFT. Eat with passion and compassion! May 6-May 20. We are looking forward to finally sharing the feature film with a large audience, and hope that reports of the film’s impact on lives continue to grow. After May 20, we plan to roll the film out into dozens of additional markets. As we approach May, please support our efforts in the initial areas so we may spread this message as wide and far as possible—and hopefully make a difference in many people’s lives. The best way to spread the message is by word of mouth, sharing links to the film’s website through social media like facebook and twitter, and writing emails to your friends and family. The best time to engage social media will be in the weeks leading up to the release. In this newsletter we’ve included a recent article that appeared in CNN.com as well as an exclusive clip from the film. Hope you enjoy. CNN.com features Forks Over Knives in a piece titled Vegans on the silver screen. Louise Morgan wishes she’d known about “plant-based” diets when she raised her family in rural Georgia some 40 years ago. Maybe, she says, it would have saved her husband’s life. Read more. Be the first to see a select clip from Forks Over Knives. View the clip on YouTube. degenerative diseases that afflict us can be controlled, or even reversed, by rejecting our present menu of animal-based and processed foods. Posted on March 24, 2011 March 24, 2011 Categories Plant-based diet, vegan thursday6 Comments on FORKS over KNIVES Update…Please Share! I found last night’s episode of BL kind of confusing and though OF COURSE I cried at the end, it wasn’t one of my favorites. The contestants got divided up into 4 teams. Jillian’s team, consisting only of Rulon and Hannah, while the others each have 3, get to pick one of the already eliminated players to come back. They pick Jay and Jen is elated. Bob takes his team to Crunch where Bob leads a spinning class. Jillian’s team gets invited to her beautiful home in Malibu where they do a multi-faceted workout. Brett’s team go hiking and Cara’s team goes, where else, but to the boxing ring. Kaylee realizes she has found the fighter in herself and is ready to go home. Today. The challenge finds the teams holding pulleys with the amount of weight they have lost. If they let go, the it will fall into the tank of water below it and extinguish their fire. This is a far cry from years ago, when contestants would tread, backwards, high up over bodies of water, and they, themselves would fall…There must have been a lot of problems with challenges that were that daring. I always thought they were way too dangerous looking, but now, with NO danger factor whatsoever, the challenges can get a little dull! In any event, the team that would hold theirs the longest, would win a video chat with family members. Red and blue are last and though Justin falls out, those incredibly focused, strong girls, Courtney and Jen, manage to be the last one’s holding their weight. Though they win the challenge, they decide to give the prize to the blue team. So nice! All the trainers push their players at the last chance workout. Kaylee announces that she is really ready to go home. Then comes the weigh in and Jay has immunity, having already weighed in. Here is where I got really confused last night, and am still totally confused when reading a recap. The contestants were told that ONE person from each team will have a vote at the elimination and the person on each team with the highest percentage of weight loss will have immunity. 4 teams, 4 people vote, right? But then…6 people vote and Justin is sent home, after stepping up and saying it was the only thing to do! When we see him at home he weighs an incredible 225 down 145 pounds. He looks amazing and is happy and proud and is now busy “calling people out,” (I hate that expression–sounds SO aggressive and immature). Then he trains the people he calls out. Week 12 left me confused and flat. Warning. I may be calling YOU out one day soon. Is it really possible to crave brussel sprouts? Last night Mitch opted into “meatless Monday,” dinner. I roasted halved brussel sprouts and cut up sweet potatoes (with olive oil, sea salt and fresh herbs). The natural color combination is so beautiful. Served with a garden salad it was just what I was craving. Mitch also had a peanut butter and jelly sandwich, and I had some Gardein beefless tips which I made in the frying pan with sliced onions. They are a DELICIOUS Gardein option and I highly recommend them. This morning’s news had a segment about the Paleo Diet. This is based on eating foods that our ancestors eat, hence it is also called the Caveman Diet. Based on eating mostly lean animal products, fish and fruits and vegetables and nuts, but no grains, no processed ANYTHING at all, it is shown to lower cholesterol and blood pressure. While obviously this is NOT for me, I can see where it could be for others. Reminds me that there are many paths that lead to the same destination. Eliminating ALL processed foods is bound to bring health benefits. That is a great idea for ALL of us. Off to start the fitness part of my day. Before finishing my fitness tonight, I plan on finding plenty of peace and relaxation. Even plan on combining BOTH, before the day is over. Peaceandfitness….however you can find them, I wish you BOTH, too.